"How Low Are We?" and "Let's Do an Abort"
2019-02-11 : according to this page, Eagle Lander 3d is now free. Why? An updated VR compatible version is just around the corner. Click the hyperlink to take note of the license key. 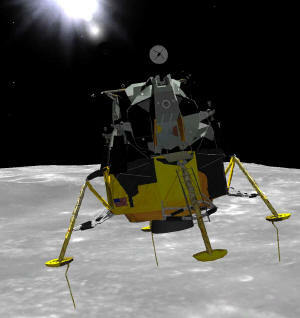 Click Eagle Lander 3d to download and install a technically accurate Apollo Lunar Lander simulation for Windows. The Apollo 11 short mission is free but $25 will get you other missions (long and short) with much more functionality. Your patronage is important to encourage the author to develop more features. Future updates are free to licensed users. Caveat: This web page was created my me, Neil Rieck, in order to help non-technical people enjoy EL3D. I am a huge fan of America's manned spaceflight program which includes Project Apollo. I am not connected in any way with EL3D software or it's author, Ron Monsen, but I would give my eye-teeth to get a peek at his source code. I now realize that the mental disorder known as "politics" will ensure that I will never get into space, but EL3D will allow me to recall an earlier time when such dreams were possible. FDAI (Flight Director/Attitude Indicator) a.k.a. "8 ball"
real sky objects including Sun, Earth, and stars. Click here to see a photo of Apollo-17 astronaut Gene Cernan flying the Eagle Lander 3d simulator. "Free Version" Caveat: "Apollo-11 Short" is the only mission enabled -and- the DSKY keypad is disabled. caveat: some commands (like "Engine Shutdown" and "Plant Flag"
Hit 3 to look down at the DSKY (Display and Keyboard). Notice you are running program 66 (PROG 66). Hit F2 to get P66 specific help. Notice that the next program after this one is P68. Hit F2 again, or ESC, to clear the help and return to the DSKY. Optional: Repeatedly hit SHIFT-G until you see PGNS-Auto at the top of the screen. You will see and hear the switch changing position. Locate the Throttle switch labeled THR CONTROL and notice it is set to auto. Optional: repeatedly hit T until you see Throttle=Auto at the top of the screen. You will see and hear the switch changing position. Here is a short list of Windows-Keys required to operate LM-Switches. Caveat: these key assignments can be changed by editing these two files: "JoyAssign.ini" (which only affects keys used when a Joystick is active) and "KeyboardOnly.ini". Operating these keys should result in hearing a click and seeing the key move. When you're finished looking around, hit key 5 or 2 to change the view then hit P to un-pause the simulation and continue descent to the lunar surface. On your numeric keypad you should enter V37EN68E* (Verb, NPAD-37, Enter, Noun, NPAD-68, Enter, NPAD-star) to complete the post landing procedures. Repeatedly hit SHIFT-G until you see PGNS=Auto at the top of the screen. You will see and hear the switch changing position. Repeatedly hit T until you see Throttle=Auto at the top of the screen. You will see and hear the switch changing position. Now hit 1 to look out the window and enjoy the automated landing. hit 3 to look at the DSKY then use your keypad to enter V37EN68E* (Verb, NPAD-37, Enter, Noun, NPAD-68, Enter) followed by PRO/ceed (NPAD-star) to complete the post landing procedures. Alternatively, you may click these buttons with your mouse. When the sim finishes initializing, click Replay: Start then sit back and watch the astronauts land Apollo 12 in the Ocean of Storms. Now hit 0 (ZERO) to begin an EVA. Press the left arrow key to rotate 180 degrees then press X so you can back out of the LM and crawl down the ladder. Hit the right arrow key a few times to turn to the right then hit W to walk forward a bit. Notice the crater on the port side of the LM containing Surveyor-3 which is 200 meters (650 feet) away. Press W to walk towards it. It will require about 2.5 minutes to get there. When the sim finishes initializing, click Replay: Start then sit back and watch the astronauts land Apollo 15 on Hadley Plain. Press your left arrow key to rotate another 180 degrees until the ladder is at your back. Make sure the shadow of the LM is directly in front of you. Note: please stop to consider the following planetary mechanics. Close your eyes and imagine a spinning Earth in front of your with the north pole at the top and the Sun to your right. The moon is behind the Earth. Since the Sun appears to move across Earth's sky from East to West, the Earth must be spinning West to East (or counter-clockwise as viewed from Earth's North pole). Apollo rockets were launch toward the East so the surface speed of the spinning spin Earth would be added to the rocket's velocity. Now imagine the same closed-eye view as before but slightly higher so you can now see the moon behind the Earth. When Apollo was launched toward the moon, it was sent on a figure-8 trajectory so the moon's gravity could more easily capture the space craft. Apollo was aimed at the left-hand side of the moon (or where it would be 3-days later), it then would travel around the backside, then would pop out on the right hand side of the moon as seen from Earth. So Apollo in orbit around the moon is in the opposite direction than Apollo's orbit around Earth. This means that Apollo landed on the moon coming out of the Moon's East with the Sun behind the LM. Since the LM begins the landing sequence with the ladder facing up, after pitch over the ladder will almost always point directly West. Visit this site ( http://www.google.com/moon/ ) then zoom into the Apollo-15 landing sit. Notice that Hadley Rill is directly to the West. See the mountain slightly to the left of the top of the LM shadow? This mountain is on the other side of Hadley Rill. Press W to walk towards it. It will require about 30 minutes to get there. Alternate variation: Why walk to Hadley Rill when you can fly there? hit 1 to look out the commander's window and look at mark 55 on the vertical red line etched on the window (known as the LPD or Landing Position Designator). Look through the marks corresponding to 55 and this is where the PGNS will take you). Hitting 8 will subtract 0.5 degrees while hitting 2 will have the opposite effect. Now hit 3 to look at the DSKY. Hit PRO/ceed (NPAD-star) to accept. Caveat: hitting the key eighteen times will cause to to land on the inside edge of Hadley Rill which is fun to watch from the Starboard-side exterior view (hit 8 then press A). You will be on a 30 degree descending slope. Another Variation: "How Low Are We? (compared to the mountains)" and "Lets Do an Abort"
Hold down A until you have rotated through 90 degrees. You are looking at a mountain top that is as high as we are. Yikes! Hold down A until you have rotated through 180 degrees. Wow, that mountain top is just as high. Now hit P to continue the simulation. Hit CTRL-A to abort the landing. The Descent Stage will now jettison. Caveat: In version 2.1.2 this section is a little flaky so you must follow theses instructions to the letter. Failure to do so will result in you hearing ascent audio but not seeing the associated video. While on the moon, hit 3 to look at the DSKY. Hit PRO/ceed (NPAD-star) for the first time. The desired downrange velocities are shown in the appropriate registers (hit F2 for P12 specific display details). You are now t-minus 60 seconds and counting. Hit PRO/ceed (NPAD-star) for a second time. Hit PRO/ceed (NPAD-star) for a third time. The DSKY Register One will shift back to the countdown in seconds. At t-minus 35 seconds the DSKY display will blank out while AGC does intense final computations. At t-minus 29 seconds the DSKY display reappears and counts down to 5 seconds. You will hear the astronaut start counting down from 9 to 5. The DSKY blanks again and a flashing 99 is displayed in the VERB indicator with a 74 in the NOUN indicator. The AGC is asking you to approve the launch. Quickly hit PRO/ceed (NPAD-star) for a fourth time. This will cause the DSKY to resume displaying the countdown sequence. The astronaut will call out "PROCEED"
At t-minus zero, ignition occurs and the ascent stage will blast off. After a short vertical ascent, the LM pitches forward to begin its acceleration into lunar orbit. You can ride along for awhile but EL3D 2.1.2 does not take you all the way into lunar orbit. As you leave the scenery area you will see the moon but you are also flying into the dark side of the moon. You may need to hit Q to move back from the alignment scope which will increase your field of view. Alternatively, hit W to move closer to the eyepiece. Hit NPAD-INSERT 15 more times to re-dock with the CSM. After a successful contact you'll see the Capture notification. Right click on vistapatch.exe then select "Run as Administrator". You will usually receive some errors, just ignore them and continue to the end. Right click on setup212.exe then select "Run as Administrator". You should not see any errors. Right click on vistapatch.exe then select "Run as Administrator". The next menu will allow you to REPAIR or REMOVE. Selecting REPAIR should install with no errors. So the Vista instructions for 212 should work without any problems on Windows-7. The members of the EagleLander3D Group just received a note from Ron Monsen indicating that a new release (probably 2.1.5) is just around the corner. Click https://www.youtube.com/watch?v=Y5wnbf0y0dQ to watch a 2-minute video preview. This is just in time for the 40th anniversary of the Apollo-11 landing which took place on July 20, 1969. Beta versions can be downloaded from here: http://www.eaglelander3d.com/downloads/ but beware that a license is still require to activate anything other than the Apollo 11 mission (the license code from 212 enables 215). Also, since this is a beta release you had better join EagleLander3D Group so that you receive problem/solution emails. Graphics hardware with "3d acceleration" is required to run this simulation. The graphics subsystem must have a least 128 MB of its own memory. So Do This First: download and install the free version of Eagle Lander 3d to ensure you have sufficient hardware. Consider using PC-WIZARD to see what you've got under the hood. For certain applications, a GPU (graphics processing unit) with "3d acceleration" (ATI Radeon, NVIDIA GeForce, etc.) is much more important than a fast CPU (central processing unit). Many newer PCs come with an embedded GPU installed on the motherboard. If this graphics subsystem doesn't have at least 128 MB of memory of its own memory (el-cheapo systems force the graphics system and CPU to share memory), or your graphics images are herky-jerky, then you can almost always add an external graphics card which contains more powerful graphics hardware. If you need to add a graphics card then you first need to know something about your motherboard before you go shopping. Note that none of these hardware technologies are slot-interchangeable. I have tested Eagle Lander 3d (v2.1.2) on many systems including: single CPU, dual-core, and quad-core. All my computers run folding@home in the background with one folding-client attached to each CPU/core. For some reason I don't yet understand, all folding-clients must be stopped in order to properly run Eagle Lander 3d on a dual-core or quad-core system. Freeing-up only one core is not good enough. Although the video and audio always initializes, there is usually something wrong with the keyboard and mouse responses. Good News: Using Eagle Lander 3d (v2.1.5) on multi-core platforms is a better experience than v2.1.2. Now running the simulation while science clients (folding@home and BOINC) are also running only results in a slightly lower display frame rate (FPS). The following resources are not required when using 'Eagle Lander 3d'. This stuff is targeted at "Space Enthusiasts", "NASA Nerds" and "Guidance Geeks"
hrst.mit.edu/hrs/apollo/public/index.htm more info from M.I.T. Table #1 - LGC Programs (Apollo 14), Luminary 1D. 05 Display Octal Components 1, 2, 3 in R1, R2, R3. 25 Load Component 1, 2, 3 into R1, R2, R3. Chapter 8 presents an overview of AGC software which seems to have cropped up almost as an afterthought. In 1960 NASA thought the computers would be programmed by mathematicians but this work turned out to be an engineering discipline. In mid-1965 there were approximately 250 people working on AGC software. This number peaked at 400 in mid-1968. This chapter also describes the low-tech LPD (landing point designator) which is comprised of colored markings on the commander's window. CChapter 11 briefly touches on many things including: installing an Apollo AGC in an F-8, The Shuttle, CEV (Crew Exploration Vehicle), glass cockpit of the Airbus A-320, etc. NNASA originally thought that the AGC software would be created by mathematicians. Later on, contractors provided "computer programmers" and "system engineers". Apollo 11 and Other Screw-Ups from Don Eyles personal web site. Note: Don was a member of both the "C. S. Draper Lab" and "M.I.T. Instrumentation Lab"
Caveat: This web page was created my me, Neil Rieck, in order to help non-technical people enjoy EL3D. I am a huge fan of America's manned spaceflight program which includes Project Apollo. I am not connected in any way with EL3D software or it's author, Ron Monsen, but I would give my eye-teeth to get a peek at his source code. I now realize that the mental disorder known as "politics" will ensure that I never get into space but EL3D will allow me to recall an earlier time when such dreams were possible.